At Paula’s Choice Skincare, we know that giving your skin the right ingredients it needs is vitally important. Doing so means your skin can be radiant, appear younger and smoother, and you’ll see fewer fine lines plus diminished wrinkles and deep lines. 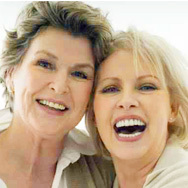 In order to help you, we summarized some of the key things to look for when shopping for anti-aging products. It can be confusing, but after reading this you’ll have a much clearer understanding of what aging skin really needs—all supported by published, scientific research, not meaningless hype! The topic of diet in connection to skin is about comparing the complex needs of your body with the complex needs of your skin. It’s a fact that our bodies need an array of nutritional foods to keep us healthy, and so does our skin. Eating only one food is never beneficial for your body, and using one great skincare ingredient (or one product, however great it may be) will never serve the complicated needs of your skin, especially as time marches on! The fact is your skin needs a balanced, elaborate mixture of powerful ingredients to improve its texture, revive radiance, visibly even skin tone, improve loss of firmness, and visibly minimize other signs of aging, including the appearance of wrinkles. Skin isn’t just surface: It’s your body's largest organ and it requires a complex range of ingredients to look beautiful and ward off telltale signs of aging. In order for anti-aging products to provide visible benefits, they need to contain specific types of ingredients which we explain below. A surprising fact: The texture of anti-aging products doesn’t need to be heavy or creamy; lighter textures can be just as “anti-aging”! As long as the product contains the best anti-aging ingredients, the texture can be a cream, lotion, serum, gel, or even a liquid formula. When any of these varying product textures are filled with proven anti-aging ingredients, they will work wonders to improve the appearance of your skin. Your skin needs ingredients that support and maintain its resiliency, counter signs of environmental damage, and replenish it with ingredients that young ksin has in abundance. Let’s go over the five types of ingredients we consider must-haves for aging skin! Without question, topically applied antioxidants are essential for skin, and there are many brilliant ones that show up in skincare products. Antioxidants include different forms of vitamins A, C, and E, superoxide dismutase, beta-carotene, glutathione, selenium, green tea and derivatives, soy extract, grape extract, pomegranate extract, and dozens of others. The more of these that are included in your skincare products, the better! Healthy, young skin’s surface naturally contains substances that keep it smooth. Doing so helps skin retain an ideal balance of water to preserve its moisture balance. These ingredients include ceramides, lecithin, glycerin, fatty acids, polysaccharides, hyaluronic acid, sodium PCA, peptides, amino acids, cholesterol, glycosaminoglycans, and many more. As a result of environmental exposure (including sun damage from not using a broad spectrum sunscreen daily), age, and midlife changes, skin can lose its ability to restore its youthful look the way it did when we were younger. One way you can help turn this around is to apply products rich in restorative ingredients like retinol, synthetic peptides, niacinamide, lecithin, and adenosine. All of these help to revitalize and energize skin’s surface so it reflects a younger-looking, visibly firmer, less lined, and more even appearance. About 75% of what we think of as signs of aging is caused by unprotected sun exposure. That's why applying a broad spectrum sunscreen rated SPF 30 or higher every single day is the most important thing you can do to decrease the risk of skin cancer and stop these early signs of aging. Ready for a shocking fact? Sun damage begins within the first minute your skin is exposed to daylight, even if it’s cloudy. To ensure you're getting sufficient broad spectrum protection, your sunscreen must state “broad spectrum protection”, be rated SPF 30 or greater, and, for even more benefits, contain a mix of antioxidants. It’s perfectly OK to layer makeup (like foundation) with sunscreen over your facial moisturizer with SPF. Note: The only significant difference between a daytime moisturizer (day cream) and a nighttime moisturizer (night cream) is that your daytime moisturizer should contain sunscreen. There aren’t special ingredients skin only needs at night and somehow cannot benefit from during daylight hours—that’s a beauty myth! Now that you know the types of ingredients that should be in any leave-on anti-aging product you use, the question is: What type of product should you buy? Should you shop for a lotion, gel, serum, cream, liquid, or balm? Thicker creams, balms, and ointments contain oils and emollients that are best for dry to very dry skin. There are hundreds of emollients, but some widely-used examples include all non-fragrant plant oils, shea butter, cocoa butter, fatty acids like lecithin, stearates, and triglycerides. Lotions and serums are ideal for normal to combination skin because of their lightweight, often silky textures and near-weightless feel on skin. These textures are also great for layering if you have slightly dry to dry skin plus clogged pores or bumps. Gels, liquids, or non-aqueous serums are extremely unlikely to clog pores and are best for oily or congested skin. Combination skin can benefit from using multiple products: i.e., a gel in oily areas (usually the center of the face) and a creamier texture on any dry spots, including around the eyes. No matter the product’s texture, every skin type needs the same types of ingredients to look younger and healthier, less wrinkled, and to help defend against environmental damage that visibly ages skin prematurely. Sunscreens, antioxidants, skin-replenishing ingredients, and skin-restoring ingredients are what the best anti-aging products should deliver so you can have better skin starting now!